June is National Dysphagia Awareness Month—which was established to increase public awareness and education about dysphagia and the individuals who suffer from it. Dysphagia is the medical term for difficulty swallowing and can occur in any stage of the swallowing process. According to the National Foundation of Swallowing Disorders, those who have dysphagia may experience weight loss or dehydration, recurring pneumonia or chest congestion after eating, food or liquid leaking from or getting stuck in the mouth, extra effort or time needed to chew or swallow and wet sounding voice and coughing after eating or drinking. Because dysphagia makes eating and drinking so difficult, individuals may experience depression, low self-esteem, lost wages, poor social performance and an increase in health risks. While dysphagia can occur at any age, it is most commonly found in adults. The difficulty swallowing can be due to stroke, brain injury, spinal cord injury, Parkinson’s disease, multiple sclerosis, amyotrophic lateral sclerosis (ALS), muscular dystrophy and cerebral palsy. At Bacharach, our speech-language pathology team evaluates and treats dysphagia. They identify oral and motor issues and offer a variety of swallowing studies, therapies and programs, including the Vital Stim swallowing therapy, modified barium swallowing study, myofascial release swallowing therapy and SOS Feeding Program. 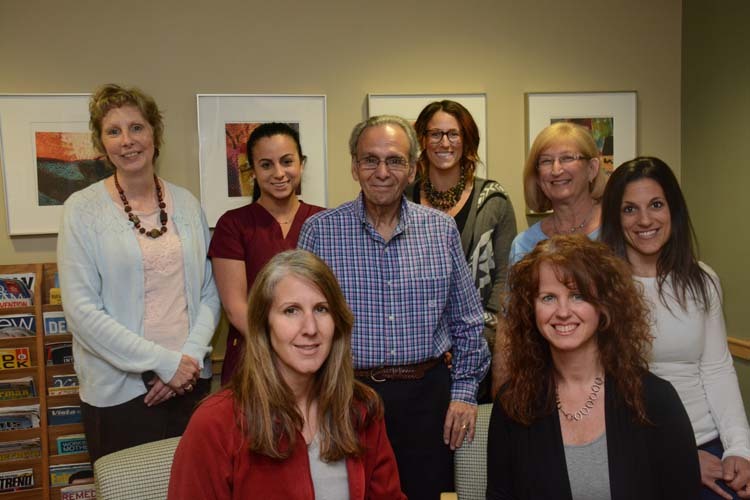 In the photo above, our speech-language pathology team is joined by a dysphagia patient. Standing are Barbara Bush, speech aide; Alicia Spinelli, MS, CCC-SLP; Paul Durante, dysphagia patient; Caitlyn Salerno, MA- SLP; Susan Spiegal, MA, CCC; and Nicole Troendle, SLP. They are joined by Jane Hocker, MA, CCC-SLP and Kathleen Diblin, MS, CCC-SLP,BCS-S, who are both sitting. To learn more about how Bacharach can improve dysphagia, call the Speech Pathology Center at (609) 748-5360 or visit Bacharach.org.